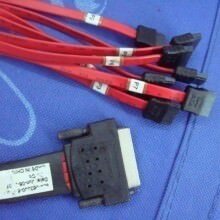 A new SCSI Data cable 68Pin VHDCI - 7Pin 8 SATA. Use : V68-pin SCSI interface switch to eight SATA connectors, V68-pin SCSI interface used to access the disk array cabinet. Click the button below to add the Amphenol VHDCI SCSI (SCSI-5) 68-Pin to 8 x SATA to your wish list.